Pictured above: Chuck Brys pays a visit to Jamie Veeser, owner of Machine Plus, LLC. 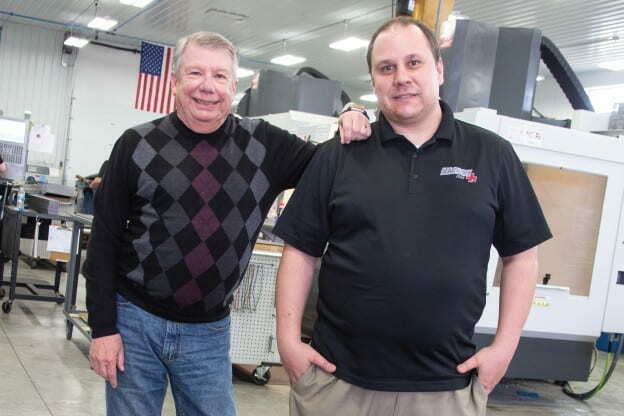 Brys helped Veeser grow his one-man shop to a $1-million-plus facility with 10 employees. After a first career of running businesses, Chuck Brys spent another decade helping others learn to run their own. The new retiree is entitled to be a little giddy these days. Strong returns can do that to a person, and Brys can point to some impressive results from his tenure guiding business start-ups as a counselor for the Small Business Development Center (SBDC), part of UW-Green Bay’s Cofrin School of Business. In 11 years, he’s forged relationships with more than 1,600 businesses, invested more than 11,000 hours, helped to launch 117 businesses, created 463 jobs and increased “capital infusion” (securing capital for growth and start-up expenses) for the companies he’s worked with by nearly $25 million. Carr said Brys’ special skill sets have made him invaluable to SBDC clients. Among those skills — his ability to be a straight shooter, his level of integrity, his trustworthiness, his financial expertise and his management experience. Brys retired at 55… the first time. Before long, he began working with an organization that allowed him to be a part-time CFO or CEO to many different companies. Later, he turned to the SBDC. The job of the SBDC is to help small businesses in whatever way they need. Be it helping an entrepreneur start a new venture, to helping a business owner figure out where their business was going off the rails. A listener who asks questions and lets clients arrive at their own conclusions, Brys coached clients through almost every type of business scenario imaginable. Sometimes, that coaching meant not starting a business at all. Other times, with his guidance, businesses grew from “one-man shops” to larger operations with multiple employees and million-dollar income streams. Consider the young man who wanted to open his own machine shop. He had the skills he needed, but not the capital. Through Brys and the SBDC, he was able to acquire $50,000 to start his business, Machine Plus, LLC. That same client just completed construction on a $1-million-plus plant. Owner Jamie Veeser (pictured right) credits Brys for his success. That was in late 2011. Machine Plus opened in January 2012. In three months the business was profitable; in six months business profits paid for a second machine in cash, and today, Veeser has 10 employees. Veeser said he never imagined being a business owner, or getting off the plant floor. Hometown Trolley in Crandon, Wis., is another amazing success story. The company’s main competitor was dropping its pricing and driving down Hometown Trolley’s profit margin, impacting the bottom line. Brys helped the company grow from a $2 million business into a $20-million, award-winning company. And the impact to the local economy was profound. Brys also helped to develop the SBDC into a larger, more productive and highly valued resource in Northeast Wisconsin. By working with local economic development offices and increasing the amount of funding the center was able to bring in, Brys transformed the organization from a group bringing in 90 clients a year to one that sees more than 300 a year, and one that now aids in securing $15 to $20 million annually in economic development funds to grow the local economy. This story by Liz Carey originally appear in the Spring/Summer issue of Inside Magazine.